Louder Than A Bomb (LTAB) was founded in 2001, through the Young Chicago Authors, by Kevin Coval (YCA Artistic Director) and Anna West. LTAB is now the largest youth poetry festival in the world, featuring more than 120 schools representing over 100 zip codes within the Chicago-land area. LTAB was created to give Chicago youth a platform to sharetheir stories. The festival has since become a “bridge” for young people from many different backgrounds to come together and find a common ground through their narratives. LTAB was founded on a student-centered, educational philosophy geared toward young people, ages 13-19. 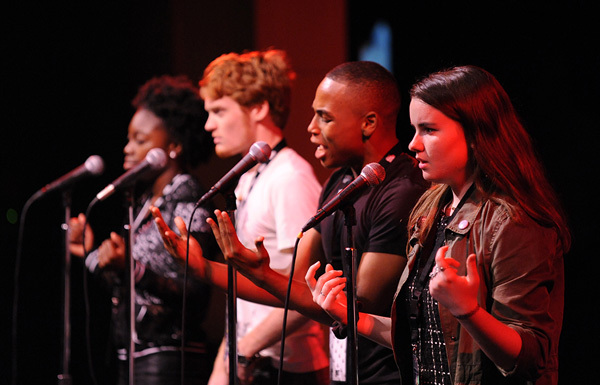 The “trick of the poetry slam,” states Coval, “is to use the guise of competition to attract interest in [the telling of stories through the written word].” The most critical component of LTAB is the year-round, meaningful instruction inside the classroom with teachers, who create and facilitate a safe space for individual and collective self-expression. Building upon the amazing impact the Omari Hardwick bluapple Poetry Network has had on area youth since launching the program in 2013, football legend Jason Taylor and his Jason Taylor Foundation are now taking bluapple to new heights by bringing the “Super Bowl of Poetry” to Broward County! 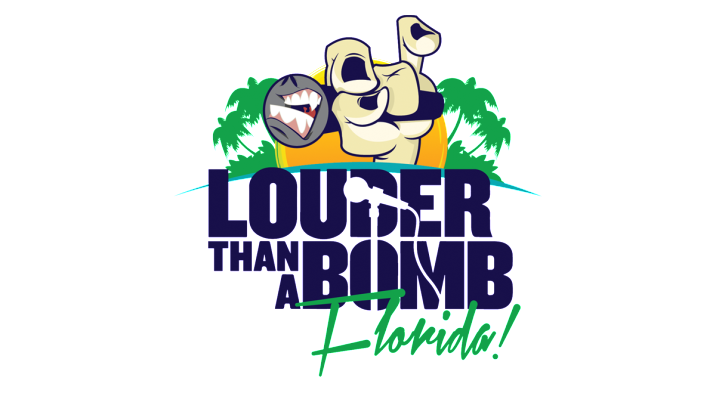 The 2014-15 school year marked the launch of Louder Than a Bomb Florida (LTABFLA), empowering and uniting South Florida’s youth and community through the art of the spoken word! Beginning in September of 2014, teachers and students from schools as far south as Homestead and as far north as Port St. Lucie, often times with the assistance of a bluapple Teaching Artist, began working, learning, creating and sharing within their classrooms, in after-school clubs and through various teen open mics throughout South Florida, developing safe spaces for individual and collective expression on their respective campuses and in their communities. The culmination of this work manifested in the 4th Annual Louder Than A Bomb Florida, a 25-day festival last April, which was highlighted by a friendly competition taking place in dynamic venues throughout the tri-county area. A diverse group of students, parents, administrators and community members representing nearly 45 elementary, middle and high schools participated in LTABFLA events, creating authentic narratives to reimagine the self and one another while developing mutual respect and tolerance for difference. To see the full impact of what this groundbreaking program had on South Florida in just its first year, please click here. The bluapple Poetry Network geared up for the 2017-18 Louder Than A Bomb Florida with full expectation of being markedly bigger and better. The fourth-year festival ran from March 28th through April 21st, 2018 and again featured a wide array of schools from South Florida and beyond, with unique exposure to some of the finest facilities in Broward County. To learn about the incredible Louder Than A Bomb 2017, please click here. Utilize the poetry slam as a community organizing tool, unifying our wonderfully diverse, extremely spread out South Florida population – LTAB bridges gaps between community borders and introduces teens who would not otherwise meet. The festival will also bring students, educators, business leaders and others from the tri-county area and beyondtogether into a variety of unique cultural, civic and educational spaces across Broward County. Make the student the center of their educational experience – LTAB inverts the traditional educational paradigm by asking students what THEY think, see and experience in their worlds, often re-engaging students at schools, while still meeting common core standards. Empower young people with tools necessary for success – LTAB provides students with a platform for their voices to be heard. These students realize the strength they possess and are validated through the stories they tell and experiences they share. Louder Than A Bomb Florida needs volunteers to serve in various roles. To offer your time and talents to this amazing event, please contact us at info@jasontaylorfoundation.com or by calling (954) 424-0799.